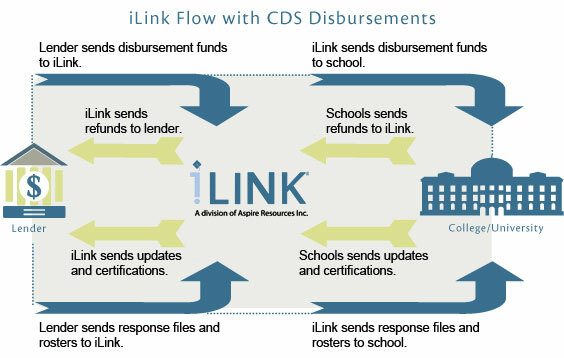 As part of the iLink file-routing system, CDS transfers money between school and lender/servicer participants. Consolidates multiple lender disbursements for schools. Disburses funds for lenders at no additional charge. Improves school and lender account reconciliation by providing one deposit and one debit for multiple participants. Simplifies bank reconciliation by providing one deposit or auto-debit services to participants. Expedites delivery and return of loan proceeds. Offers schools a choice to receive disbursements on certain days of the week. Allows different bank accounts for disbursements and return of funds. Provides schools with funds the same day as the CommonLine Disbursement Roster. Provides lenders with funds the same day as the CommonLine Change Send File.